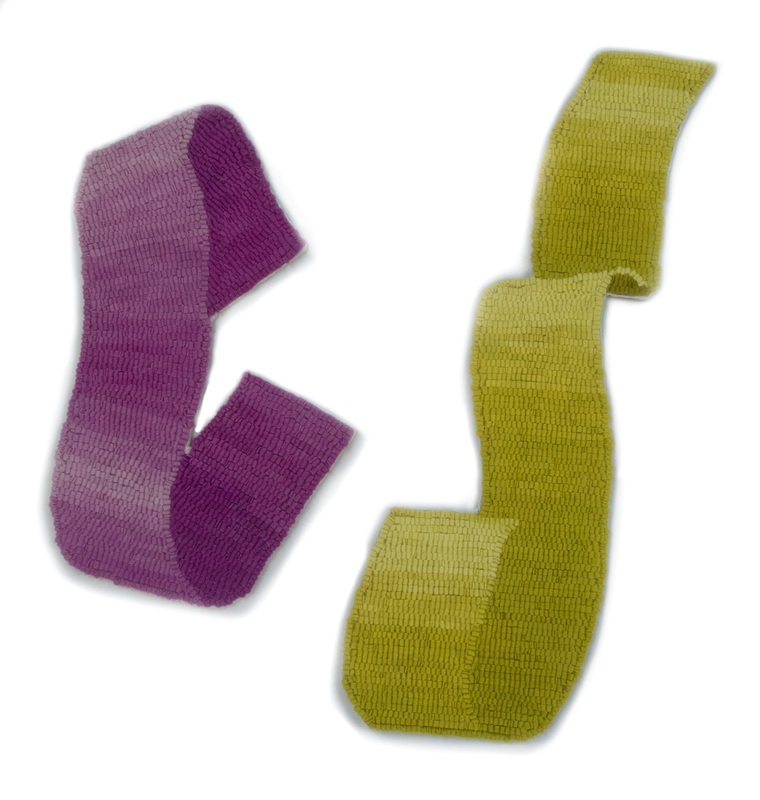 Two New Textiles: "Cherry Ribbon" & "Chartreuse Ribbon"
My two most recent paintings were inspired by the drawing studies for these textiles, which you can see at this blog post. 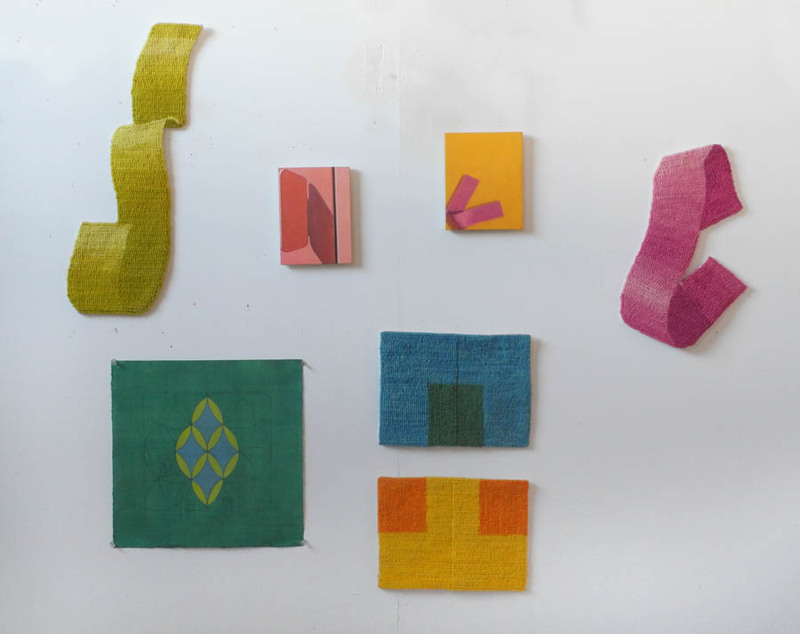 Not only was I excited about making paintings based on these ideas, I was excited about the textiles too. 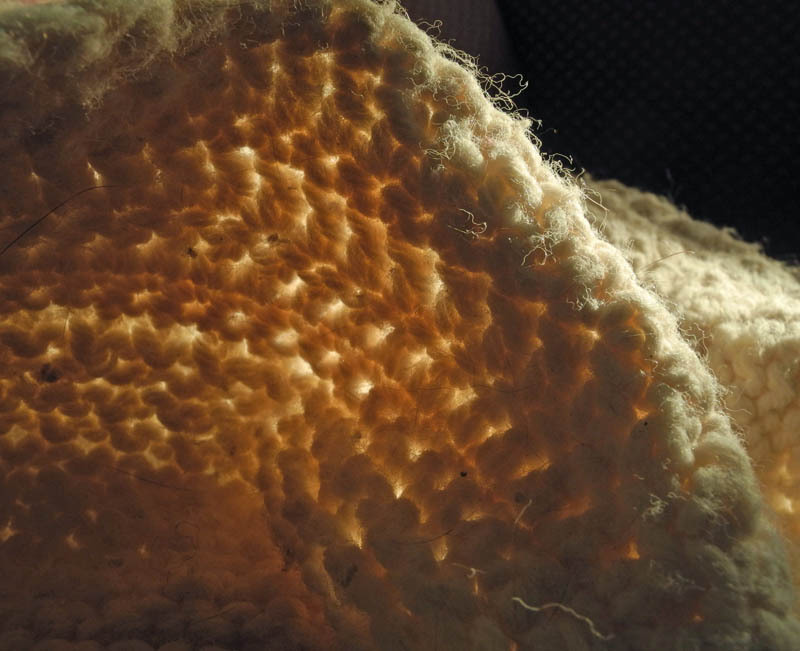 I've enjoyed making shaped pieces––you can see two recent works here––but haven't done anything quite this sinuously complex. 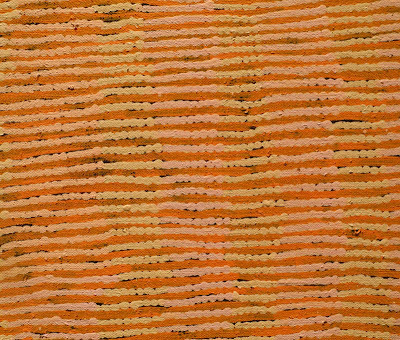 Cherry Ribbon, hand dyed wool on linen, 16 x 9 in. I like playing with illusion, as imperfect as my attempts are. 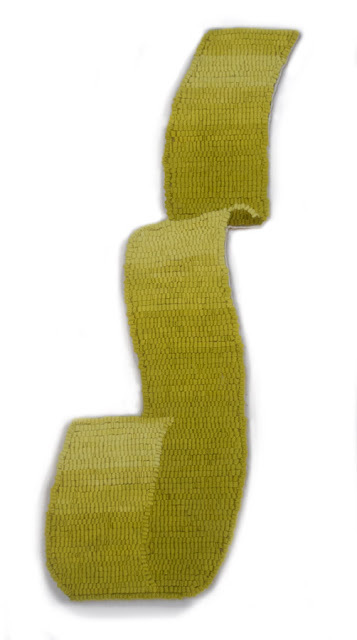 Chartreuse Ribbon, 22 1/2 x 8 1/2 in. I also want the forms to be interesting, to hold the space around them in an energetic way. 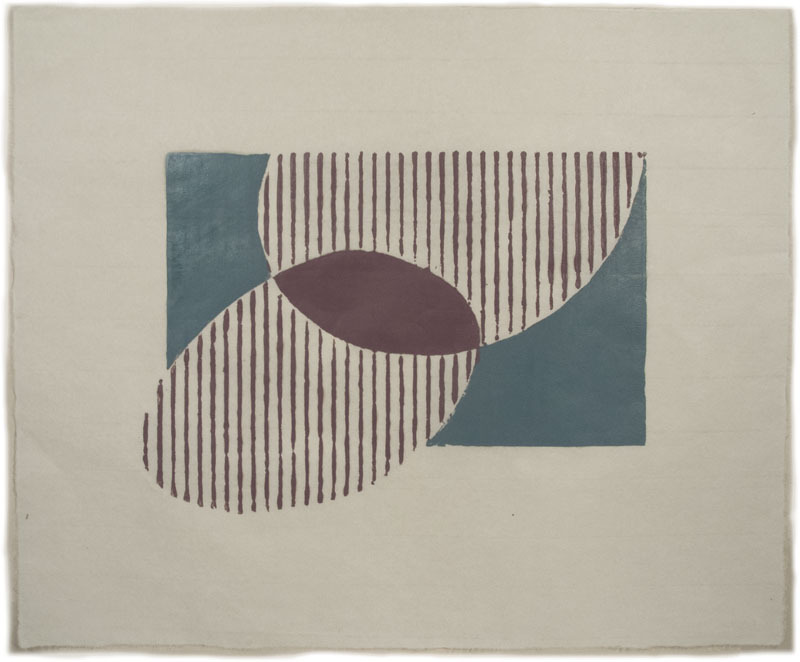 Making these illusionistic pieces is a good deal more complicated than textiles with flat shapes. 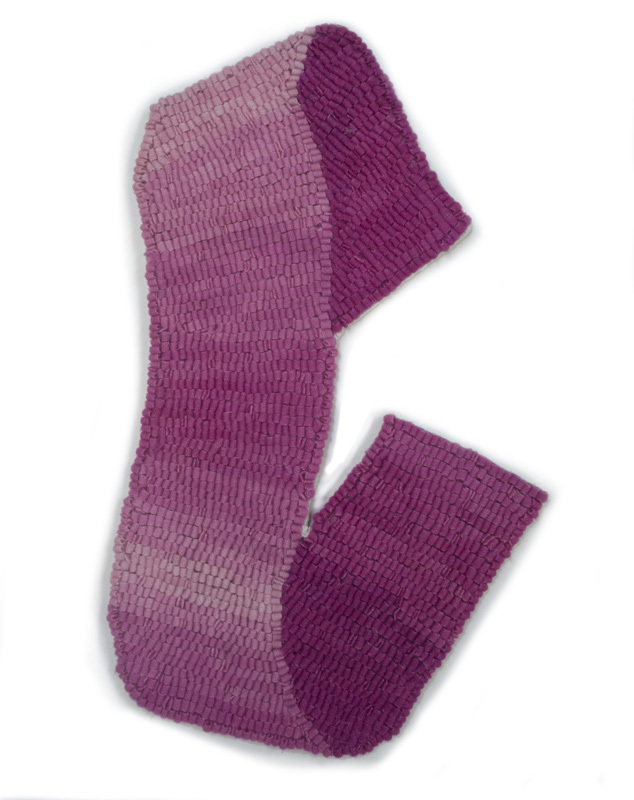 I dip dye a long piece of wool, gradually adding more and more of it to the dye bath so that one end is dark and it lightens gradually toward the other end. 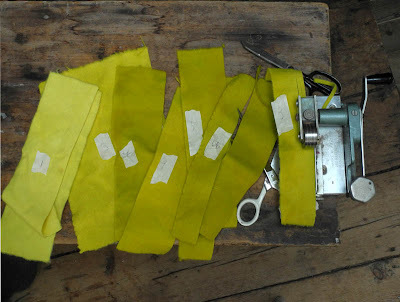 I then cut the wool apart into its graduated values, labeling each one, from 1 to 7. Being organized really helps the work along. The small hand-cranked machine you see clamped to the table is my wool cutting tool; it cuts the wool into narrow strips for hooking. I put some recent pieces up on my studio wall to see how they felt about each other; not bad, I think. 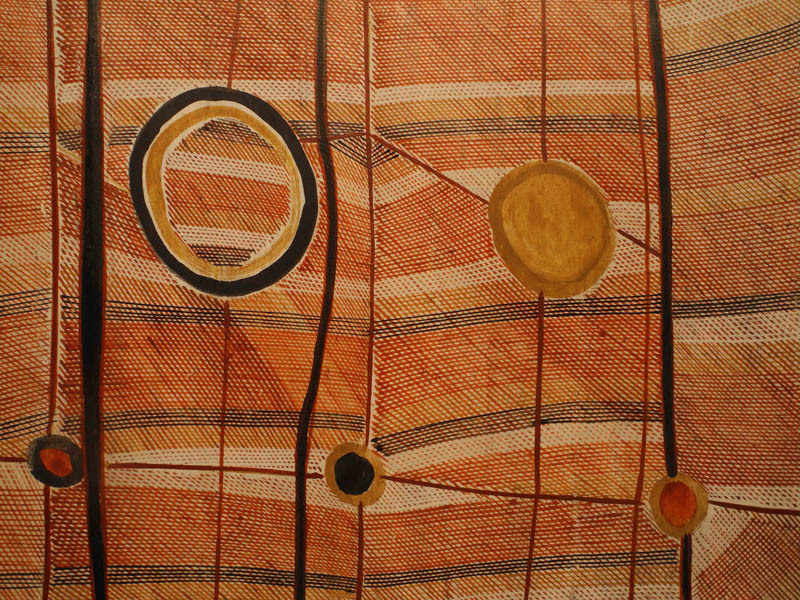 Lena Nyadbi, Jimbala, Jeering and Daiwul Country, 2001; ochres on canvas. 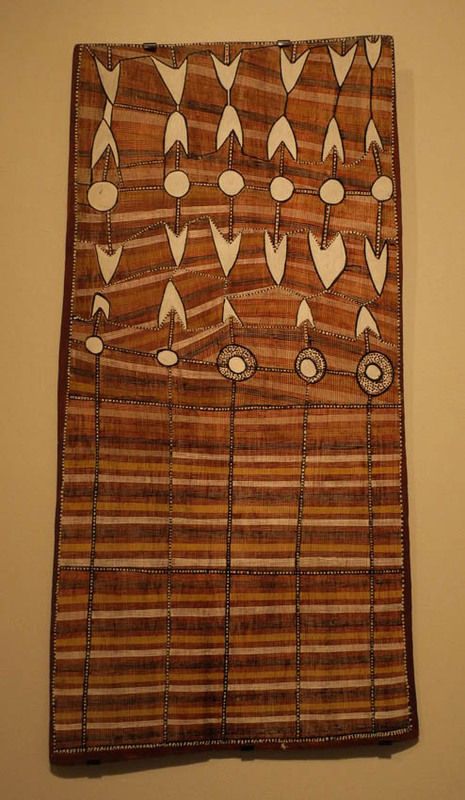 It is amazing to me that an art that comes out of a strong spiritual tradition, with deep roots over millennia, can seem so vibrant and fresh to my eyes. 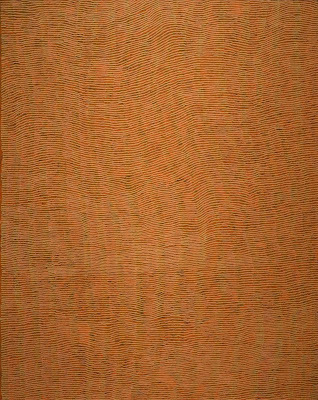 The Australian Aboriginal paintings on canvas can stand with the best contemporary abstraction in formal terms, with additional emotional weight coming from their meaning. There is a beautiful selection of these works currently in an exhibit, Crossing Cultures: The Owen and Wagner Collection of Contemporary Aboriginal Australian Art at the Hood Museum of Art. 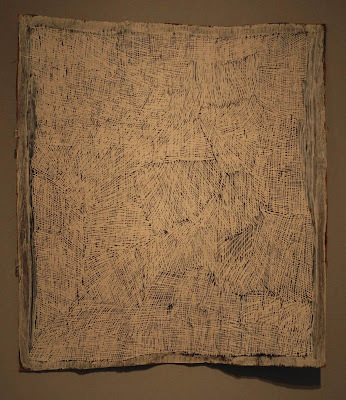 I wrote a blog post about the paintings on bark in the exhibition, which you can read here; in this post I am showing the paintings of the central desert, which are mainly acrylic on canvas, which seems a strange medium for work so tied to tradition. 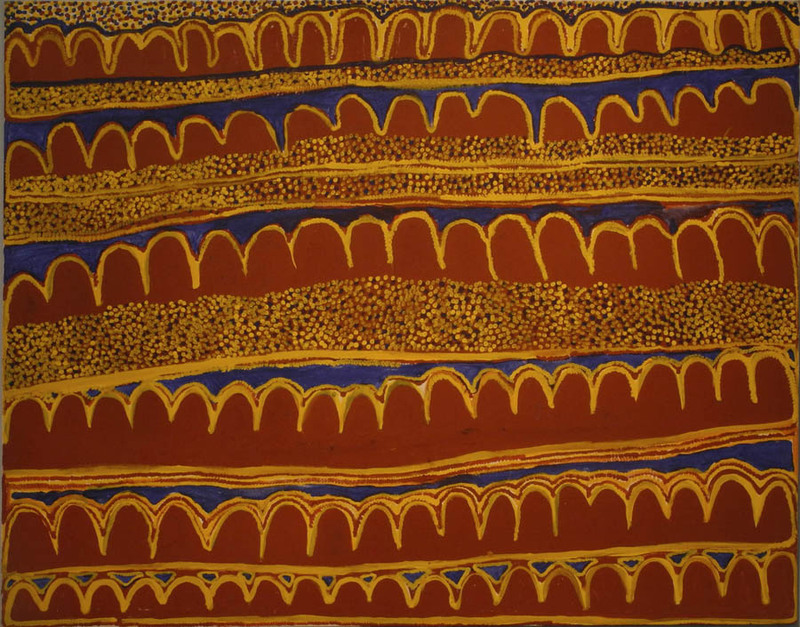 The story of the beginnings of these paintings is very interesting: for thousands of years, Australian aboriginal painting was done on rocks, on sand, on bodies. 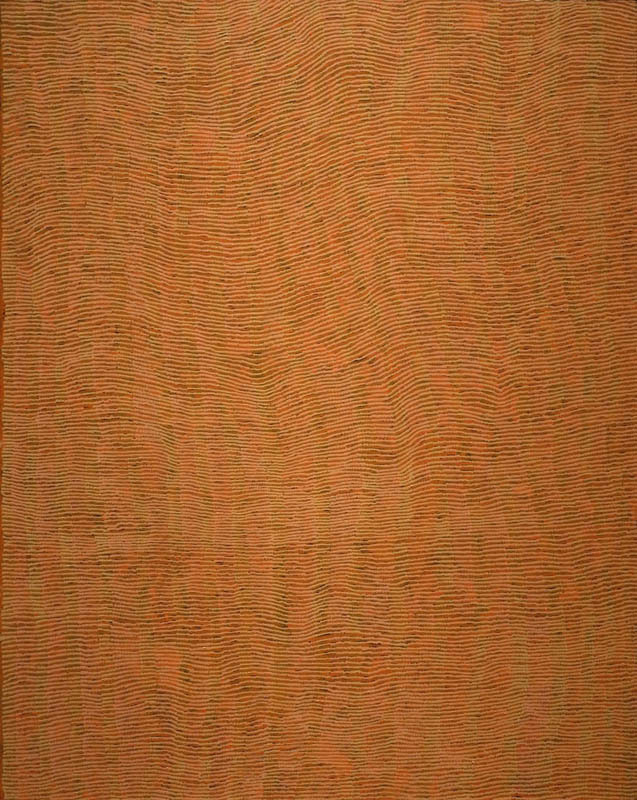 It wasn't until 1971-2, when art teacher Geoffey Bardon encouraged the men at Papunya in central Australia to put their ephemeral sand paintings onto canvas, that a new world of painting began. At first the work was quite controversial; sacred designs meant to be solely for ritual and only seen by initiates were being shown. 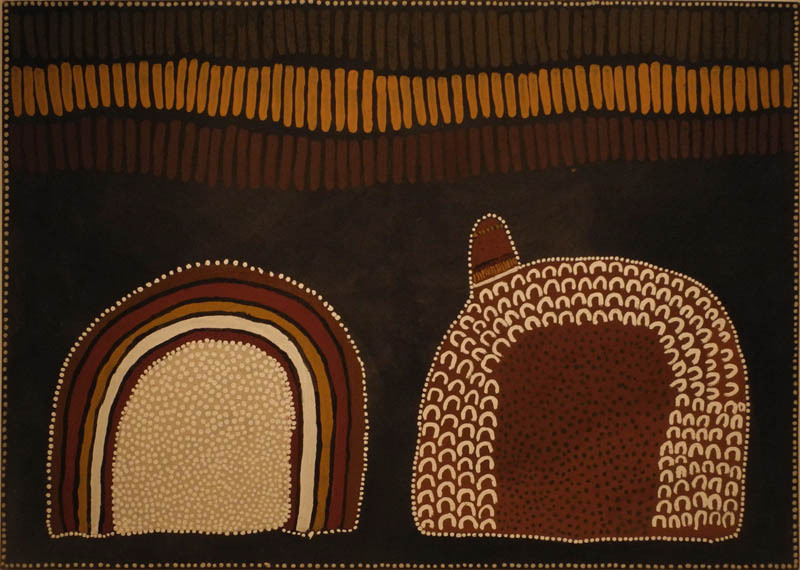 Soon the artists confined themselves to depicting symbols that were not secret and could be seen by the public, but they still used traditional dot patterning, and the paintings continued to be immersed in the sacred landscape. 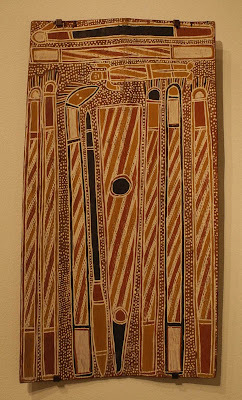 The curved forms in the painting above refer to caves where, in the Ancestral period, the fish Daiwaul took shelter from a group of women seeking to net him. 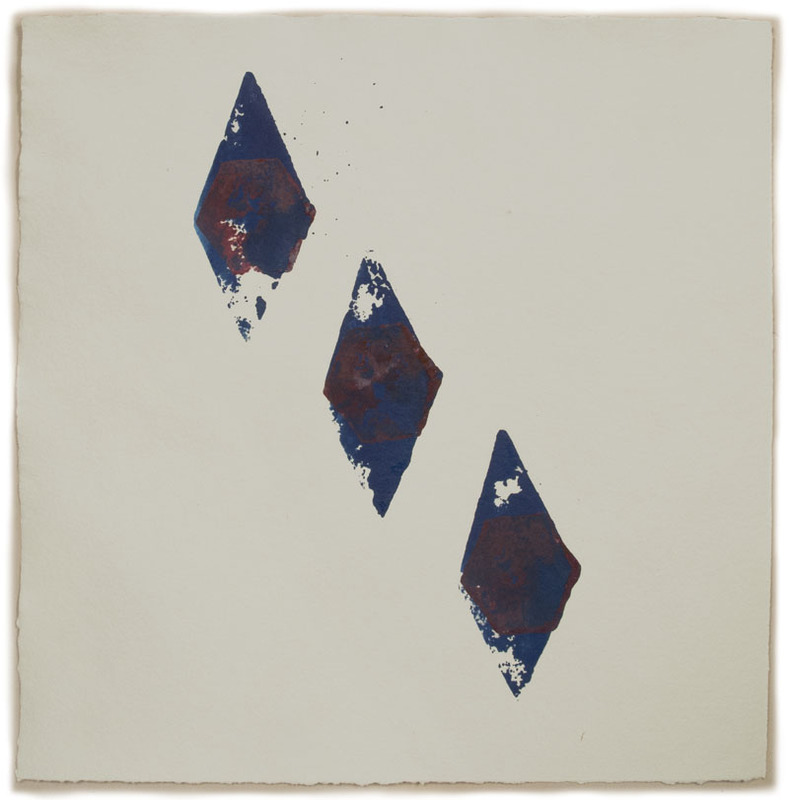 He escaped by jumping over them and shedding his scales, which became varied colored diamonds in the landscape. This site in Western Australia, has been despoiled by a mine, now the largest producer of diamonds in the world. 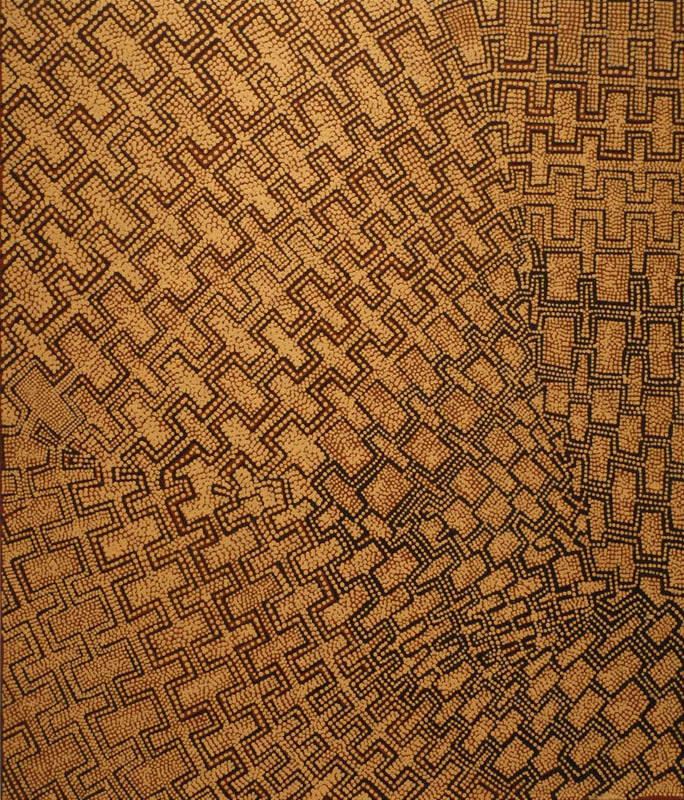 Narputta Nangala Jugadai, Murrtja Kapi, 2003; acrylic on canvas. 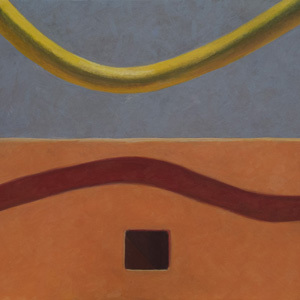 Small curves, the mounds of hills separated by the blue of rarely running creeks in the artist's ancestral home. 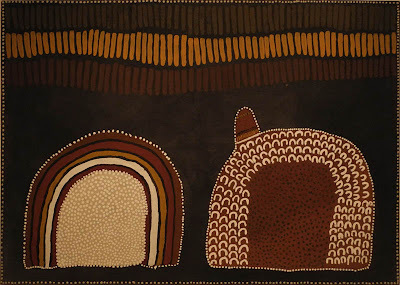 In this painting, she is paying homage to the land of her mother, south of Uluru, also known as Ayer's Rock. 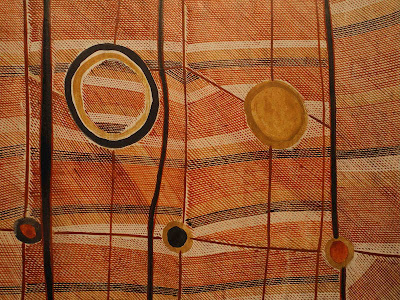 Raymond Tjapaltjarri, Litjardi, 2005; acrylic on canvas. 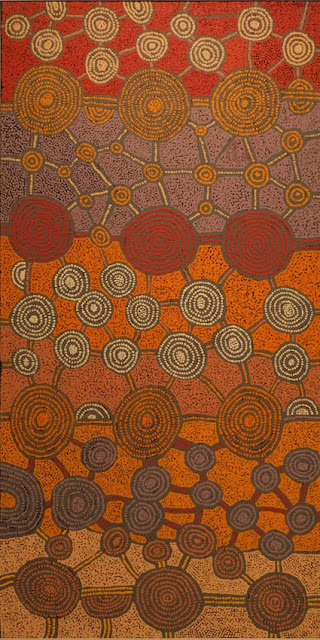 Ronnie Tjampitjinpa, Fire Dreaming at Murmunya, 2003; acrylic on canvas. 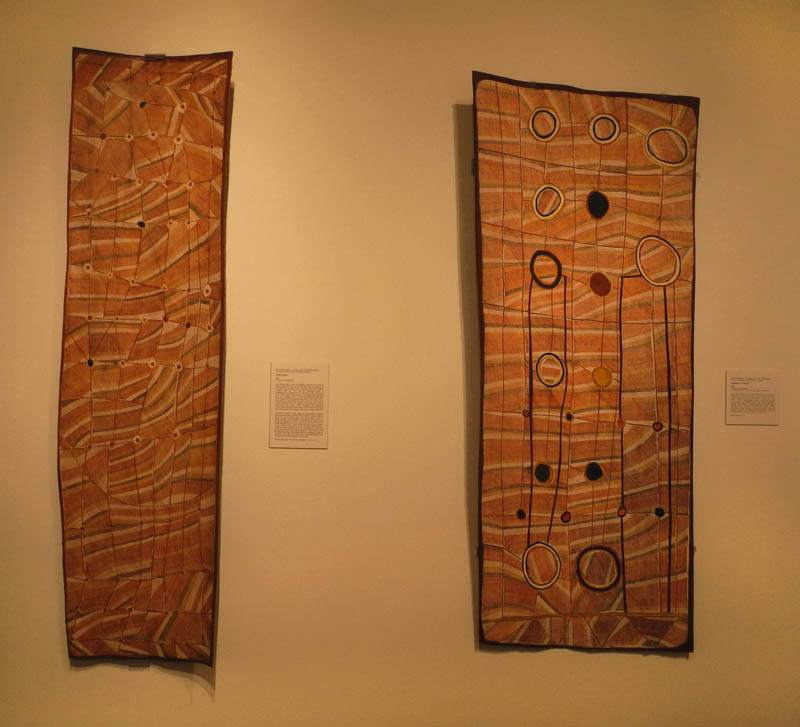 In these two paintings, the linked circles represent the travels of Tingari men during the Ancestral period, when they created the land. 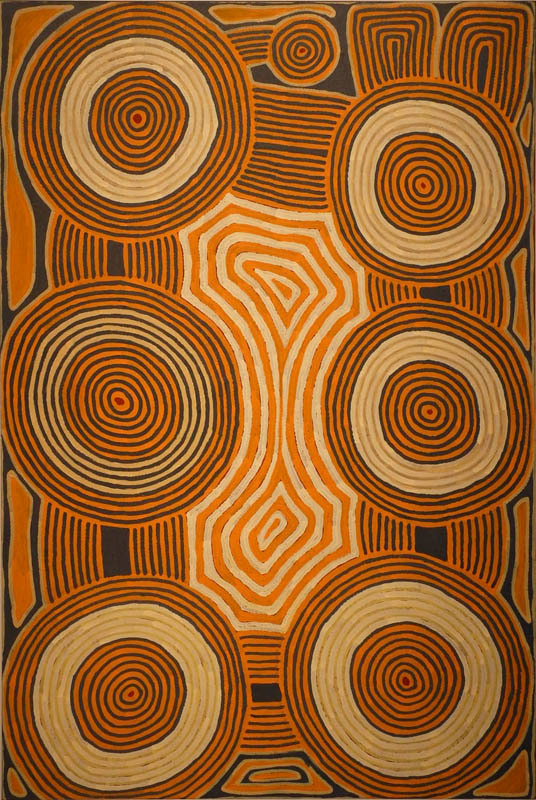 Litjardi is a water site in the Western Australia desert, and at Murmanya the Tingari established the technique of burning the land for regeneration. 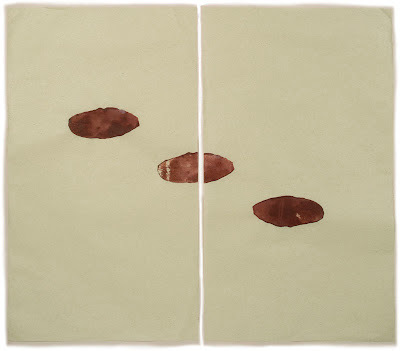 It is wonderful to know the stories behind these paintings, but the images themselves, without knowing their meaning, have the power to enchant. 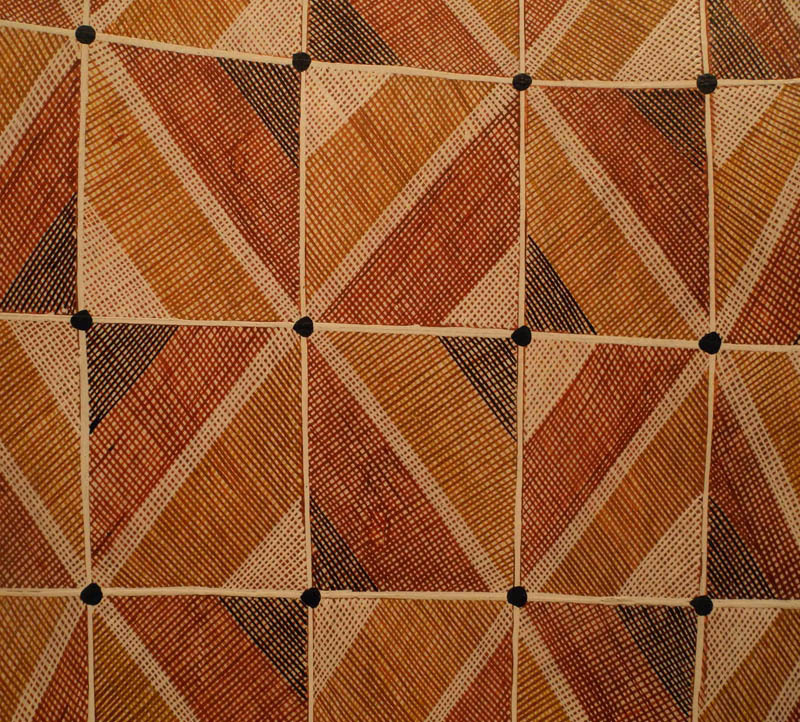 Joseph Jurra Tjapaltjarri, Pukaratjina, 2006; acrylic on linen. 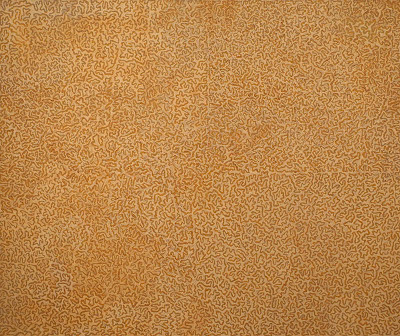 This remarkable painting, made up of thousands of dots making wandering lines across its large surface (all these paintings are medium to large sized; this one probably five feet wide), shows a water site. There the men would camp and weave hair-string belts which were worn during ceremonies. 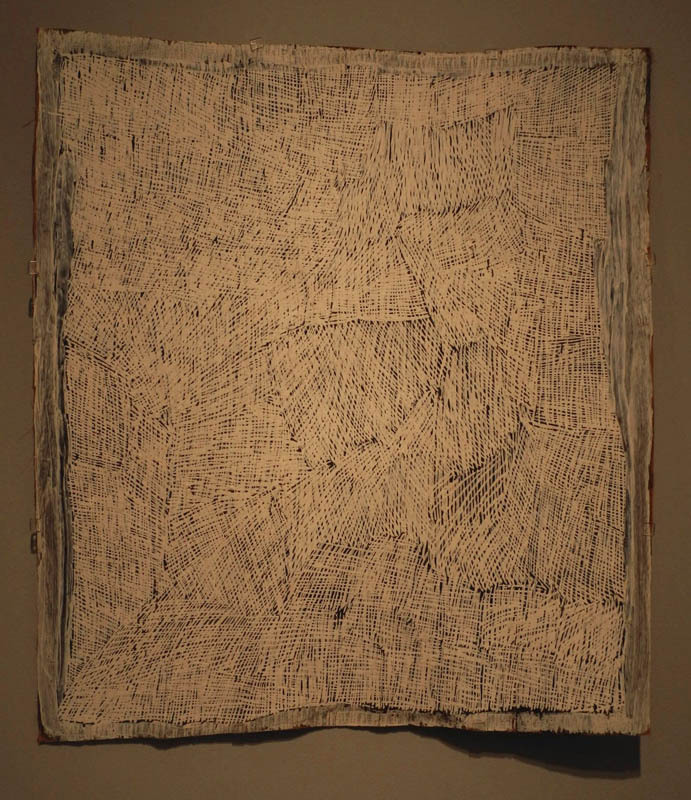 The dots are made by sticks dipped into paint. 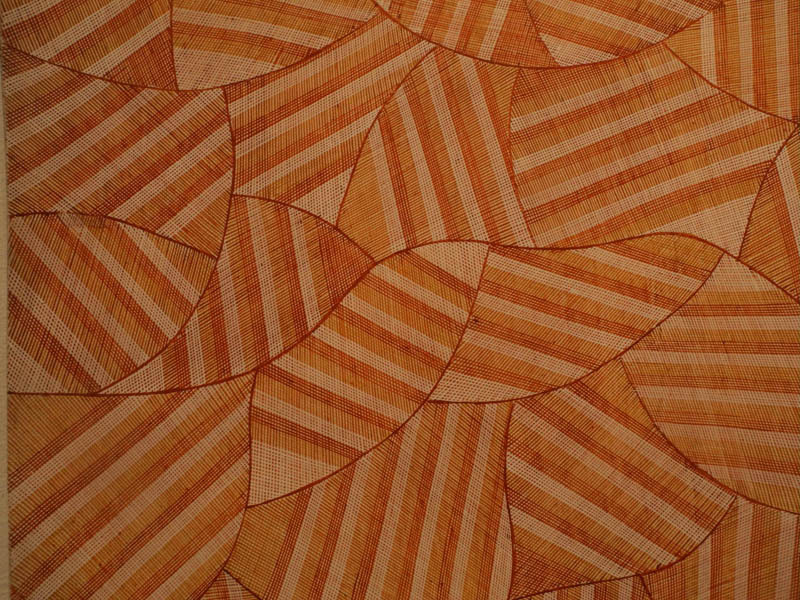 The technique has a mesmerizing effect as you follow the meandering marks. Danny Gibson Tjapaltjarri, Mukula, 2009; acrylic on canvas. 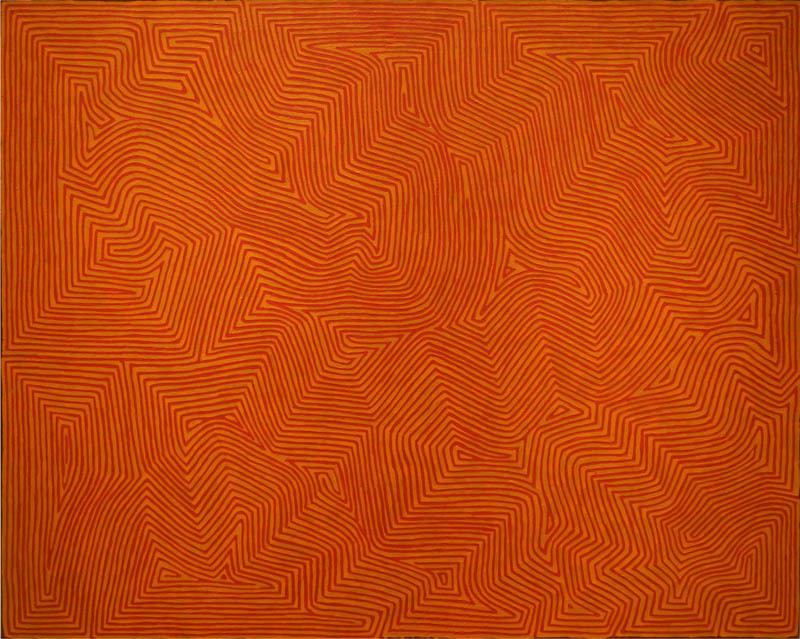 I love the geometric patterning of this painting, with the sense of shapes moving outwards from a central site. This image is also about the journeys of the Tingari men of Ancestral times. Mukula is another ancient ceremonial site. 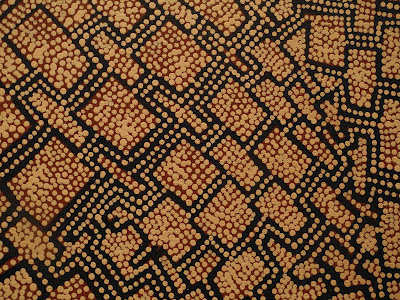 Yukultji Napangati, Yunala, 2006; acrylic on canvas. 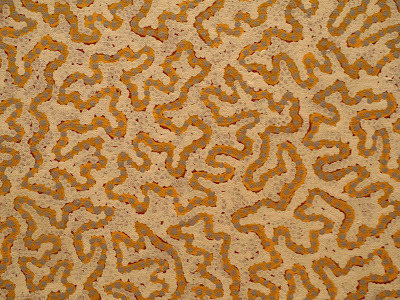 I felt awed when I stood in front of this painting; the power of its repeated dots, subtly shifting, was palpable. 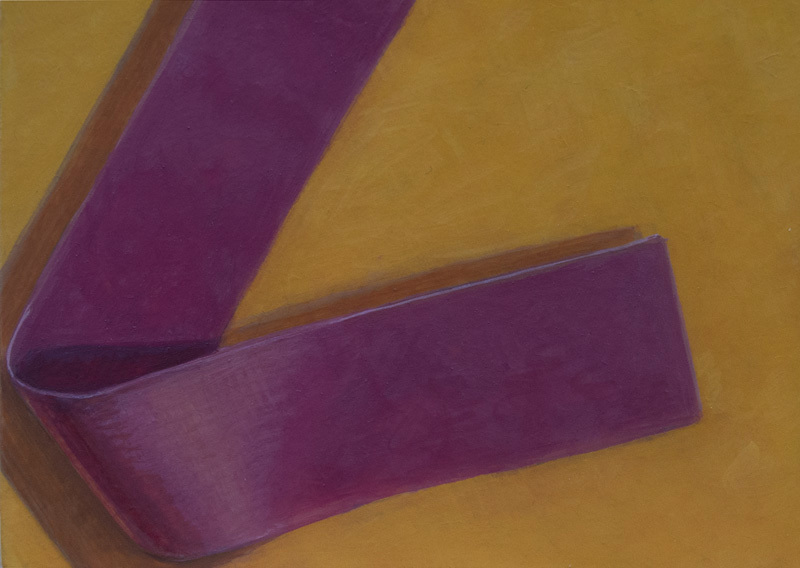 Perhaps an online viewer can get more of a sense of this from the detail, which you can imagine spreading across the entire surface of the canvas. Yunala is a site were Ancestral women gathered food, the roots of the silky pear vine, twining underground. George Tjungurrayi, Karrilwarra, 2009; acrylic on canvas. 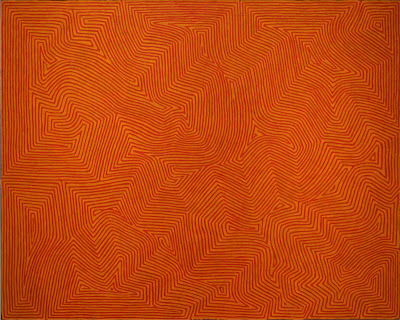 Red and orange lines angle and curve in a stunning pattern that seems geometric and organic at the same time, or like a topographical map. 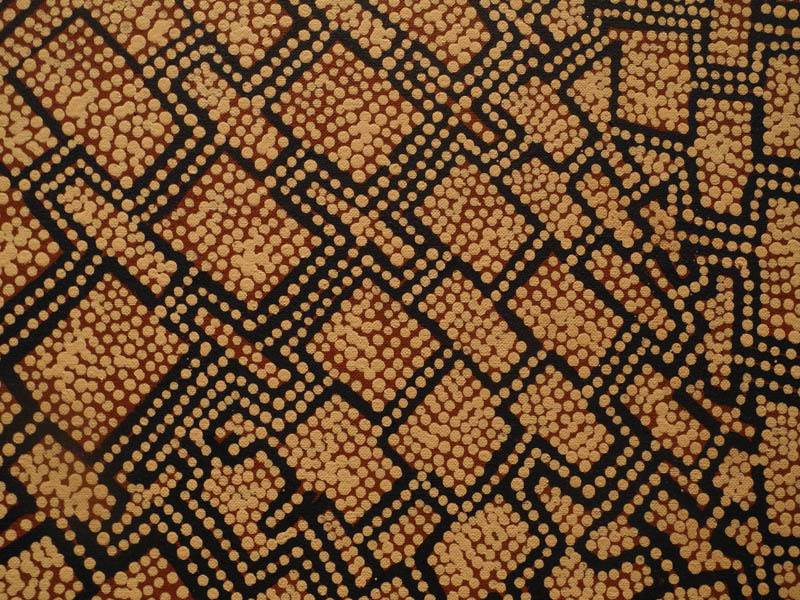 Karrilwarra is an ancient site associated with the Snake ancestor, who created the sand hills, water soakages, and rock holes of the area. 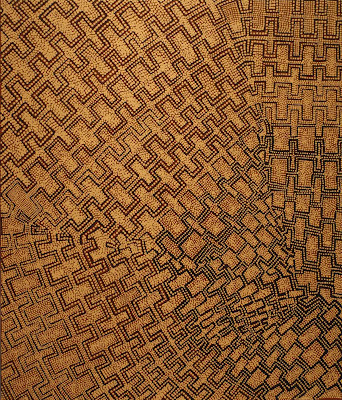 Makinti Napanangka, Lupulnga, 2005; acrylic on canvas. 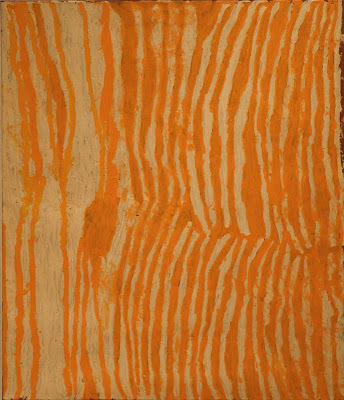 This painting was different from most in the exhibition with its free handling of expressive vertical marks, seemingly untied to a traditional expression. 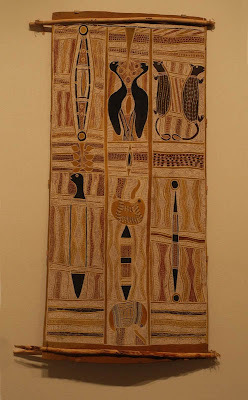 But I learned from the wall label that the lines refer to hair-string belts worn at the waist for sacred occasions. Lupulnga was a ceremonial site for women, and the artist's birthplace. 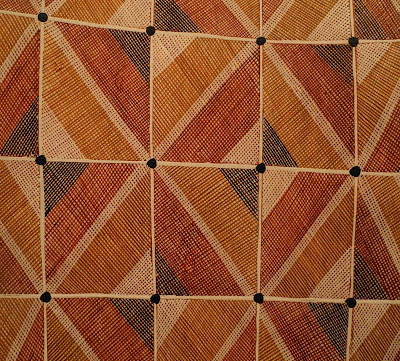 Because this was a women's site I assume the artist is a woman; a good and important characteristic of the Aboriginal art movement is the large number of women painters involved. 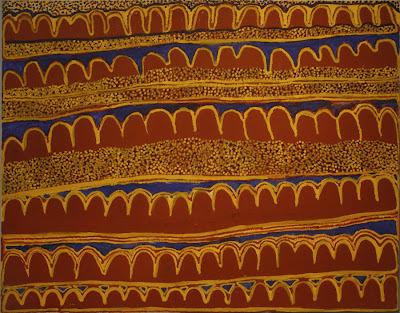 It is wonderful that the thousands of years of Aboriginal culture has interacted with the contemporary world to give us these works, so tied to the past yet so alive. 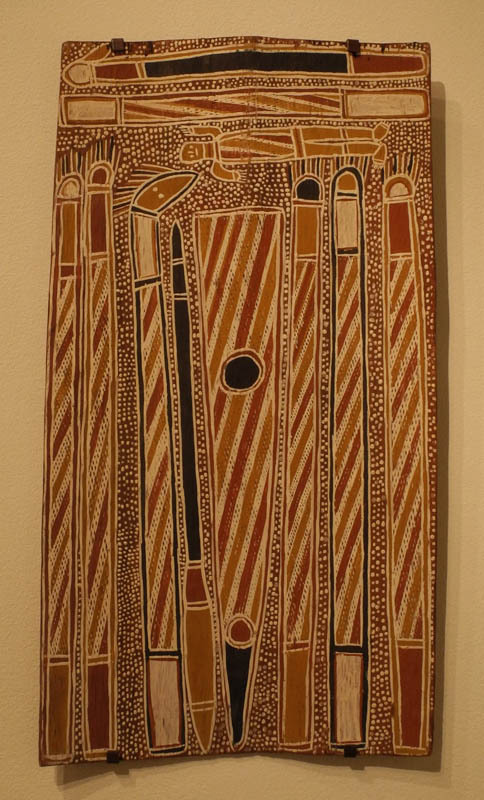 *To see a blog post on the bark paintings in this exhibition, click here. 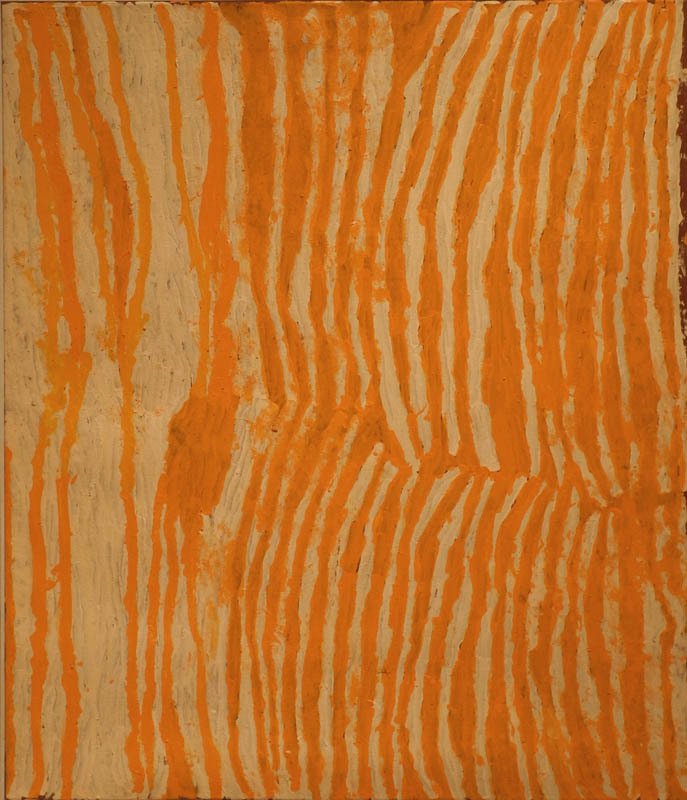 Untitled (Orange, Pink), egg tempera on calfskin parchment, 7 1/2 x 6 in. Here is my second painting in my new series of still lives using pieces of wool left over from textile projects (you can see the first painting and an explanation of this new idea in this blog post). 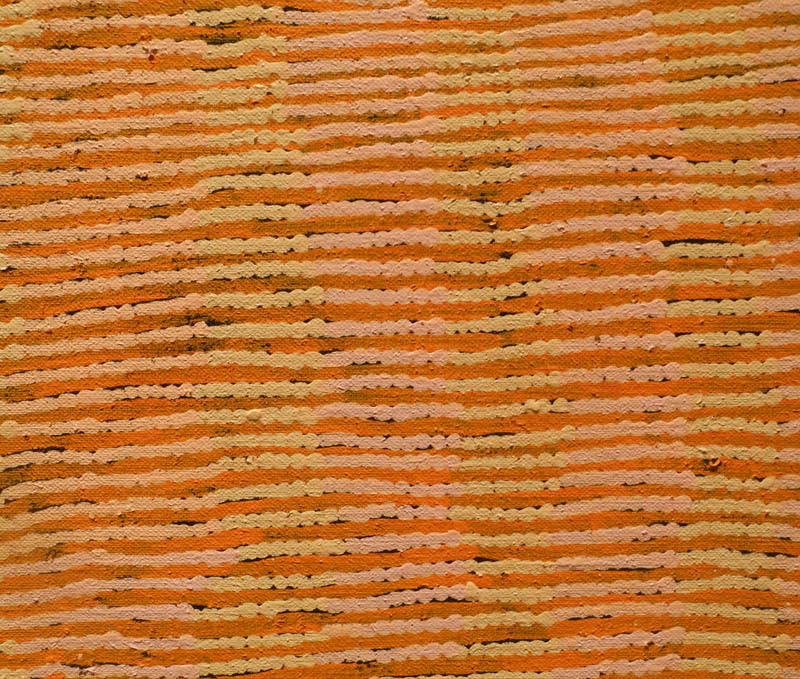 This image is a good deal simpler than the last, with just one folded form floating at the bottom of an orange field. It would seem that these works are quite easy to paint, very straightforward, but no. I have a tendency of wanting to slosh the paint around when I'm working with a large, flat area of color; what happens, though, when I do that is the paint builds up in a clunky manner, it attracts all manner of dirt and dust, and ends by looking awful. 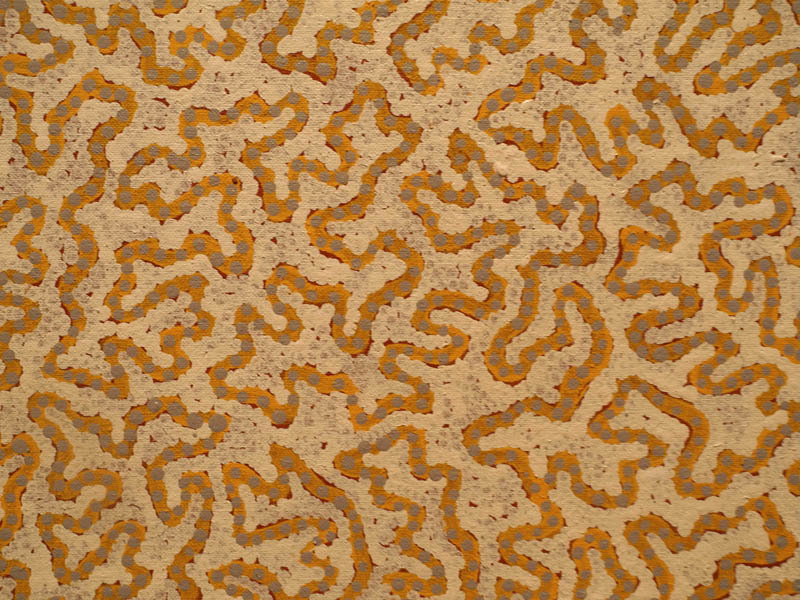 This is egg tempera, not oil paint, and the beauty of its color comes from translucent layering. 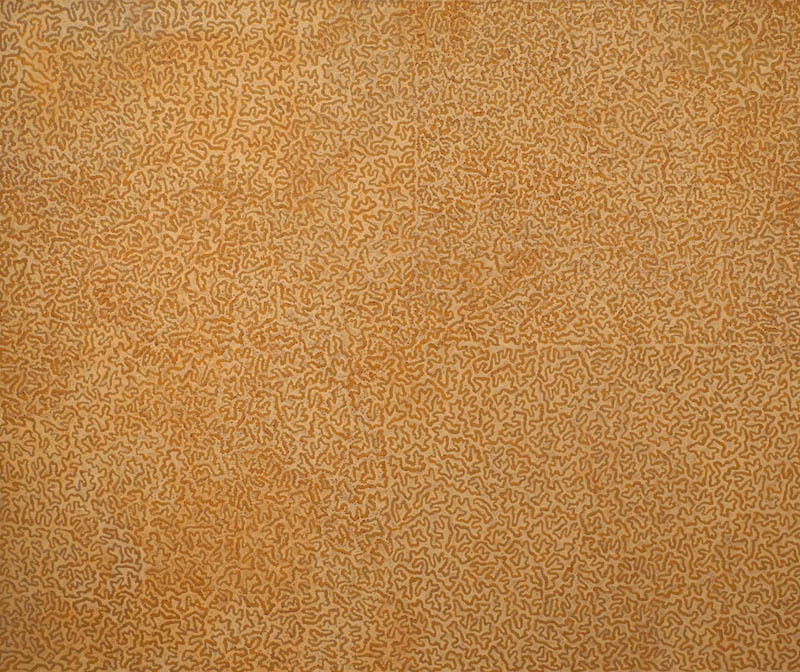 I wiped off the first painting twice––each time after several hours of work––before the third attempt worked because I slowed down. This painting needed only one fresh start after the background color got away from me. 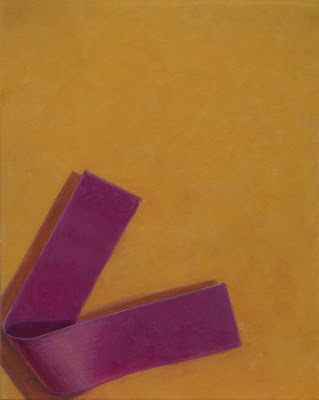 Sometimes it seems that I have to learn to paint anew every few months. 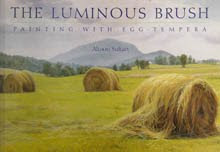 When I began working in egg tempera, I used the classical technique of cross hatching; I abandoned that for a looser brush mark several years ago, but still find it useful at times. You can see some hatched marks in the light curve of the pink shape. 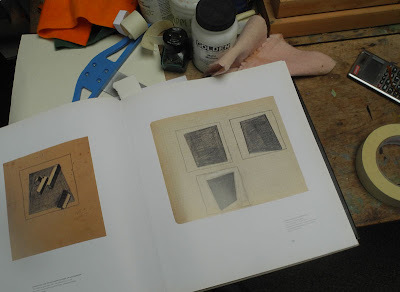 Kazimir Malevich drawings, from the book Kazimir Malevich: Suprematism. When I began this series a couple of weeks ago, I took out my Malevich catalog and had it open on my work table for inspiration and support. The strength and depth of his simple compositions move me; although my paintings are almost baroque compared to his, I would like to aim for that clarity and emotion (with a tickle of humor from time to time). "Ah, how everyday things touch mysteries for us!" "Even daily life should ultimately reach an essence that is akin to poetry." Abbas Kiarostami, from Around Five: The Making of Five. 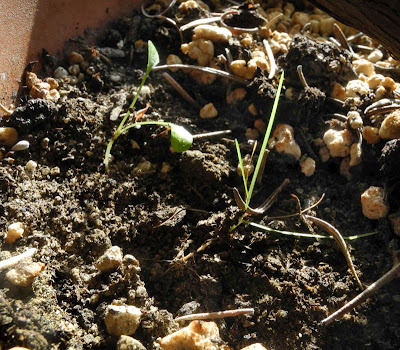 "Even a clod of dirt can be appreciated aesthetically if framed in the right way." Winter's sharp indoor sunlight encourages noticing, and highlights ordinary things usually overlooked. 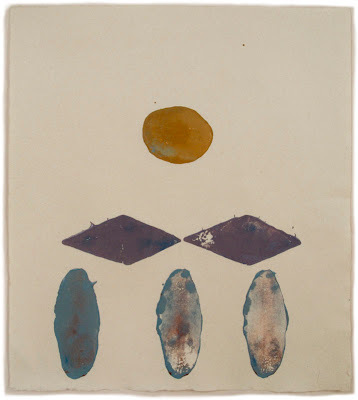 For some previous posts in this occasional series, click here. 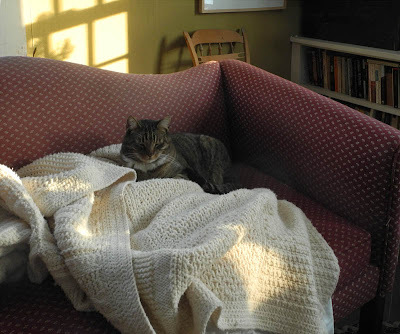 Wouldn't it be wonderful if we could be like our cats, who dash around furiously and then, in a moment, settle down comfortably for a nice nap? I have been reading the words of writers, divided by more than a century, and by vastly different cultures, aiming to address our frenetic and tense lives, with much to say in common. In his 2009 book, no self no problem, Anam Thubten, a Tibetan Buddhist meditation teacher, writes that "meditation is about resting completely". 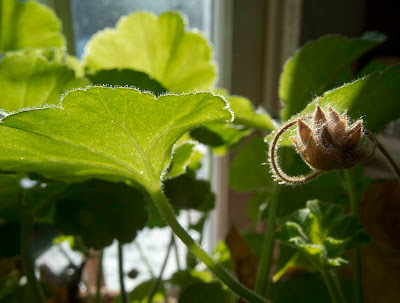 [Meditation] is simply the art of resting and relaxing. Complete rest includes letting go of all forms of mental effort....a deep rest, an inner rest, a rest in which we let go of all forms of mind's effort, including mind's effort to maintain this illusory self. I am speaking about a deep relaxation in which we are no longer trying to hold on to anything. action and feeling go together, and by regulating the action, which is under the more direct control of the will, we can indirectly regulate the feeling, which is not. we wish our trains of ideation and volition to be copious and varied and effective, we must form the habit of freeing them from the inhibitive influence of reflection upon them, of egoistic preoccupation about their results. For by the sensations that so incessantly pour in from the over-tense excited body the over-tense and excited habit of mind is kept up; and the sultry, threatening, exhausting, thunderous inner atmosphere never quite clears away. If you never wholly give yourself up to the chair you sit in, but always keep your leg and body muscles half contracted for a rise...what mental mood can you be in but one of inner panting and expectancy, and how can the future and its worries possibly forsake your mind? 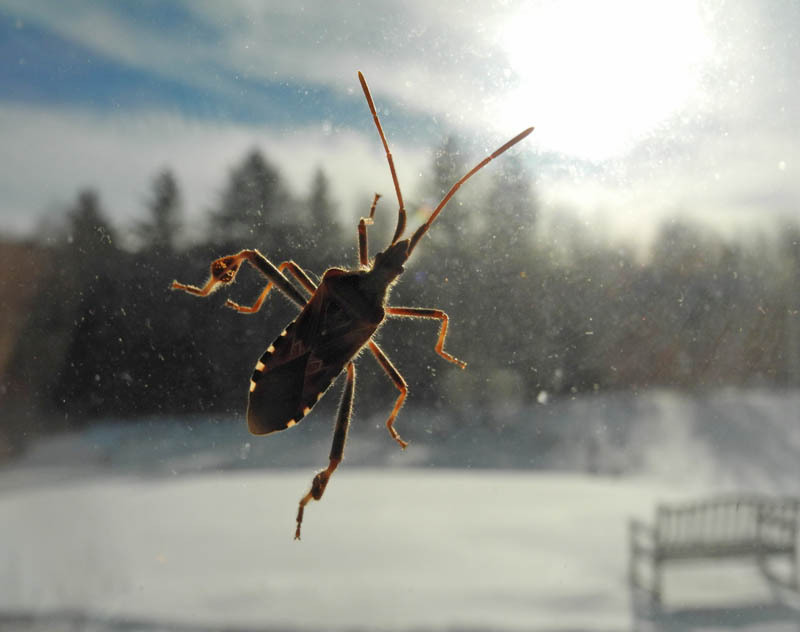 He tells us to "unclamp", and the Buddhist teacher Kongtrul Rinpoche tells us to "let go". Both these philosophies, Buddhism and American pragmatism, show us a way forward, to relax the body and therefore the mind. *I have written two other blog posts on William James' writing, on "Habit", and "On a Certain Blindness in Human Beings". He is a fascinating and eloquent writer. 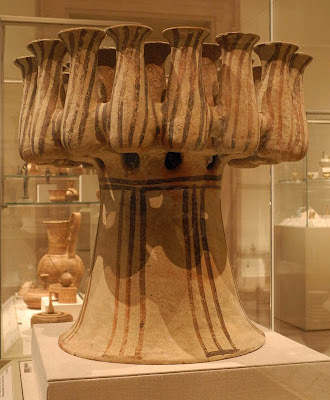 Terracotta kernos (vase for multiple offerings), Cycladic, ca. 2300-2200 B.C. 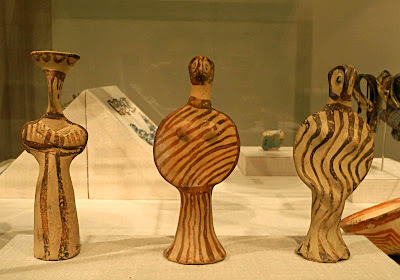 There is a gallery at the Metropolitan Museum of Art that I enjoy visiting almost every time I walk down the hallway of Greek sculpture; it is Gallery 151, that houses a collection of early pieces from Greece, of the Cycladic, Minoan (of Crete) and Mycenaean periods. 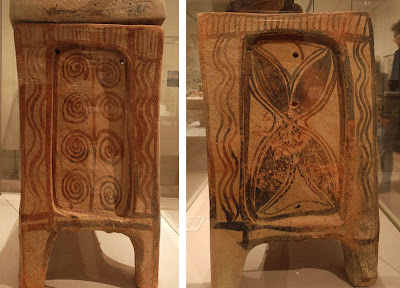 These cultures were of the Bronze Age and stretched from 3200 to 1050 B.C. 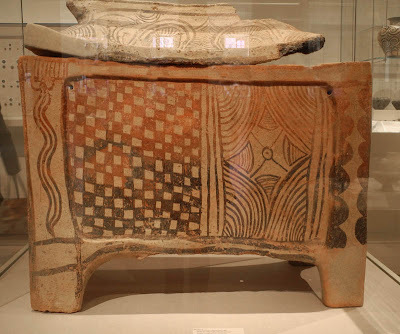 Although I love the simple, abstracted figures of this period (you can see one here), on my last trip I found myself entranced by objects, vessels and containers of terracotta, a medium close to the earth, decorated with simple, bold patterns. 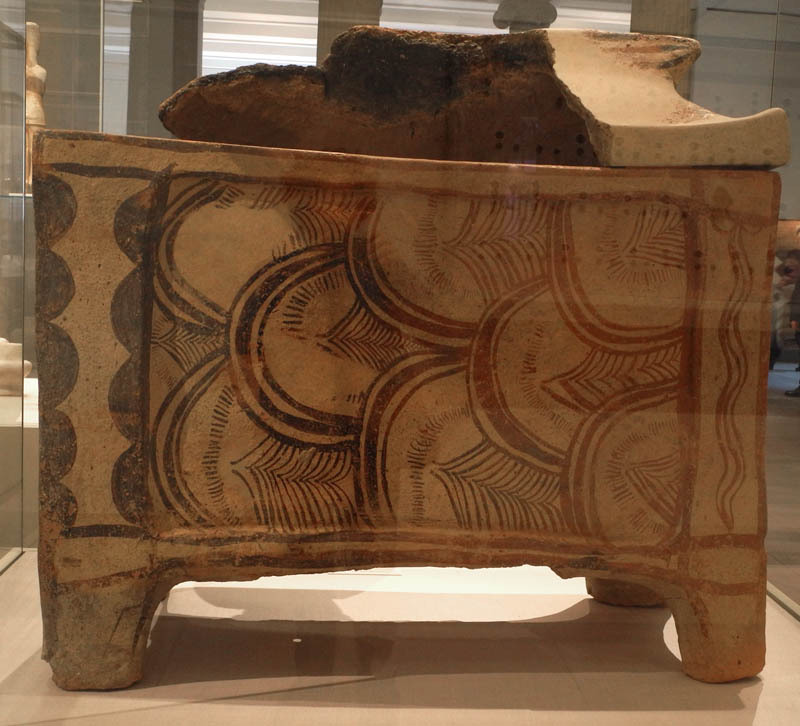 This stunning object has 25 openings for offerings, the outer ones fluidly striped, with with more lines emphasizing the flaring shape of the stand. 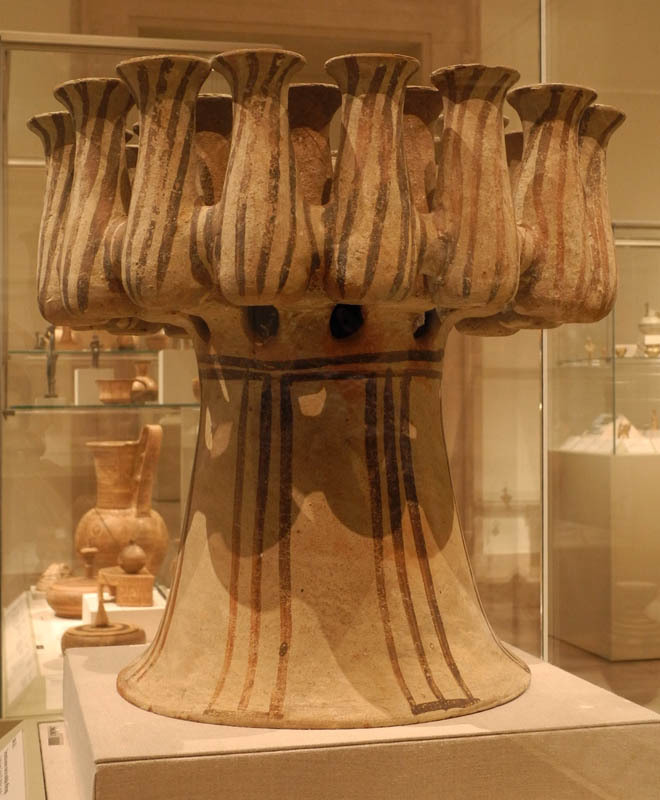 Terracotta kalathos (vase with flaring lip), Cycladic, ca. 1150-1425 B.C. The depiction of grasses on this vase is delicate and graceful. Terracotta jar with three handles, Minoan, ca. 1600-1500 B.C. This Minoan vase has a very different character: bold and inventive patterns declare a dramatic presence. 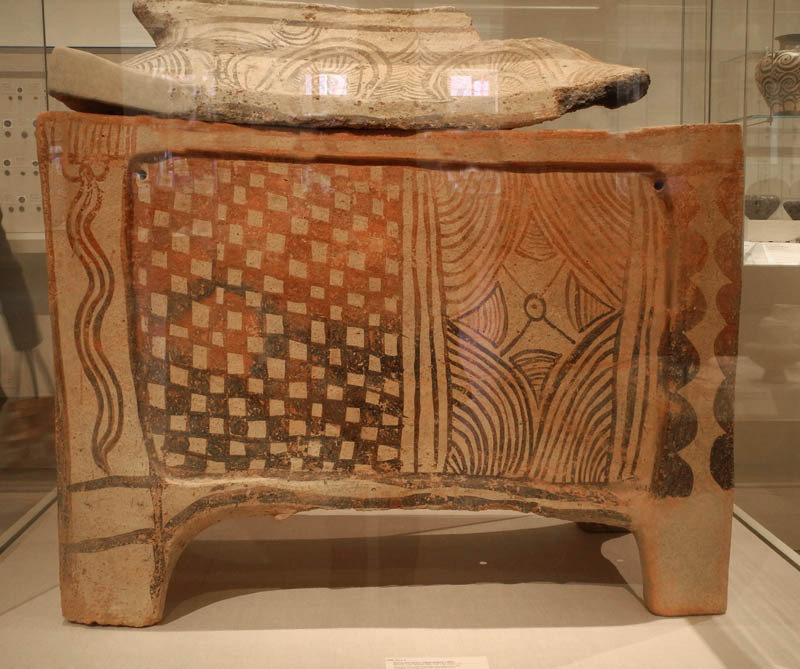 Terracotta larnax (chest-shaped coffin), Minoan, mid 13th century B.C. Isn't it wonderful how each side of this chest has vividly different and inventive designs? They are mainly organic, plant inspired forms, except for that wonderful checkerboard/diamond pattern. It's too bad we can't order up coffins like this nowadays. 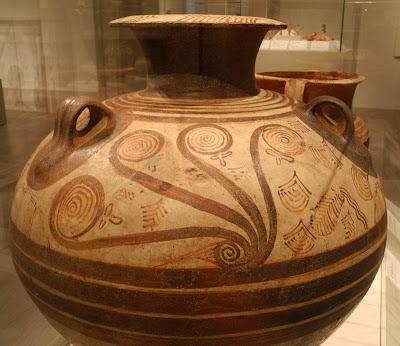 Terracotta jar with Nautiluses, Helladic (Mycenaean), ca. 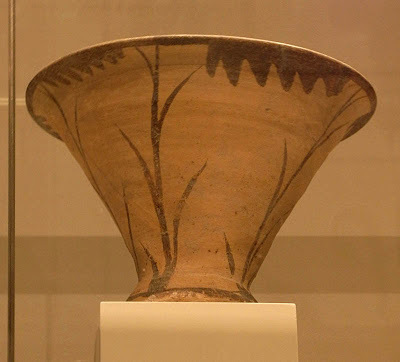 1400-1300 B.C. 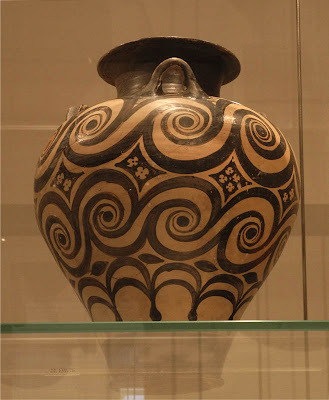 More beautiful, flowing, natural patterns adorn a full-figured jar with a flaring mouth. 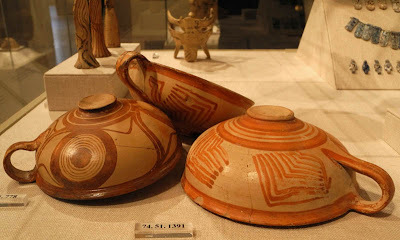 Three terracotta one-handled cups, Helladic (Mycenaean), ca. 1400-1300 B.C. 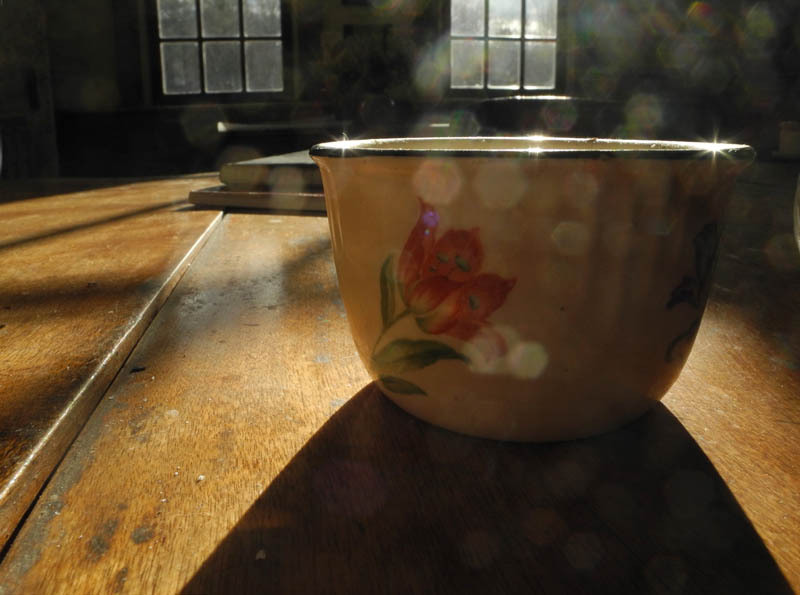 I love seeing the varied patterns on the same wide, shallow cups. 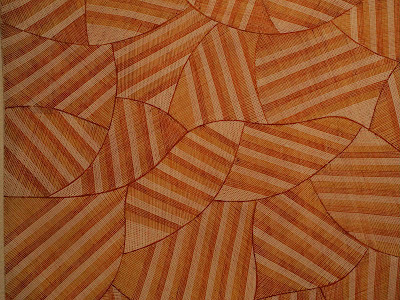 I'm particularly fond of that bull's eye whose circles repeat the horizontal circular bands. Three terracotta female figures, Helladic (Mycenaean), ca. 1400-1300 B.C. Finally, here are three charming creatures, seemingly human female, but two having heads that look a bit birdlike to me. 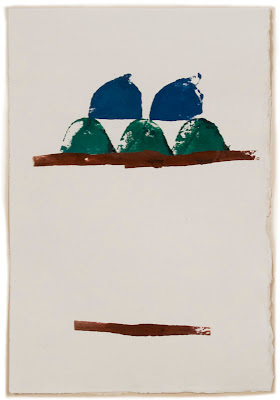 At any rate, their outlines, rounded and flaring, and the lines of paint that decorate them are whimsical and marvelous. 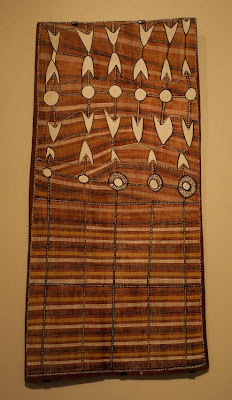 While writing this post I kept thinking how lucky I am to be able to travel the world's art in one encyclopedic museum. 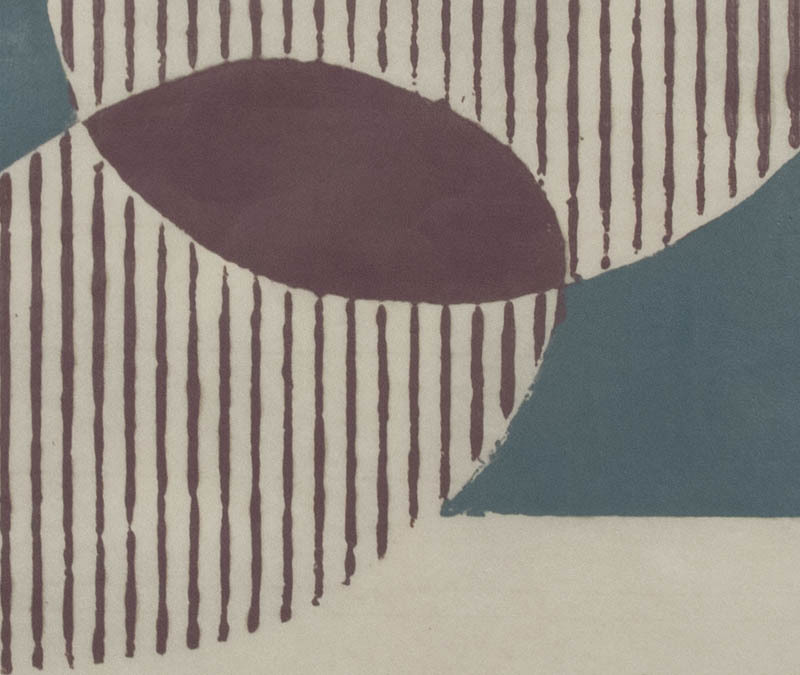 Here's a link to several posts on art at the Met; thank you, Met!